At the launch of the Doha Round, ministers of the WTO stated that a central goal of the negotiations was “to improve the trading prospects [and to] ensure that developing countries, and especially the least-developed among them, secure a share in the growth of world trade commensurate with the needs of their economic development”.1 That intention did not represent a radical shift in multilateral trade negotiations. In fact, for over half a century ‘special and differential treatment’ (SDT) for developing countries has been a staple of the world trading system. In recent research, I assess the theoretical foundations and empirical evidence about SDT (Ornelas 2016). SDT has many facets. For example, developing countries are allowed to adopt fewer liberalisation commitments in multilateral trade negotiations, often simply acting as bystanders. Another, salient dimension of SDT is the system of non-reciprocal preferences, of which the Generalised System of Preferences (GSP) is the most extensive. This has been possible since the early 1970s under the ‘Enabling Clause’, which allows WTO members to offer non-reciprocal preferential market access to developing countries. Such ‘special treatment’ has produced significant trade policy heterogeneity across WTO members. For example, both bound tariffs (that is, ceilings on how high an import tariff can be) and applied tariffs (those actually charged by customs) are considerably higher in developing countries than in developed economies. 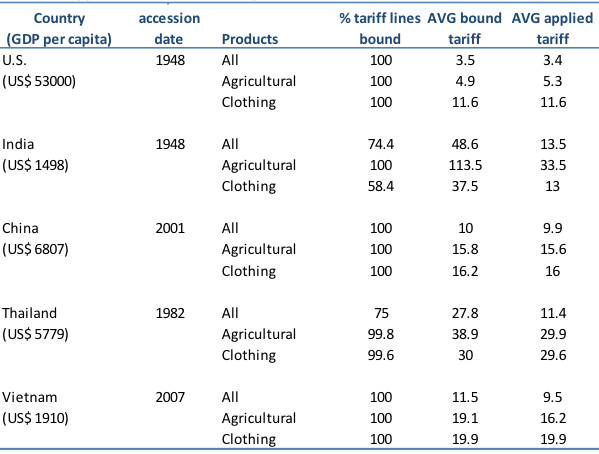 Moreover, sectors in which developing countries possess comparative advantage, like agriculture and clothing, face worldwide duties significantly higher than most other sectors. Table 1 illustrates those consequences –which constitute a general pattern in the WTO – with the corresponding figures for one developed and four developing countries. The situation changed somewhat during the Uruguay Round of multilateral negotiations, which ended in 1994, when SDT was viewed as an outdated concept in need of change. As a result, during the Uruguay Round developing countries were required to liberalise and to adapt their trade policies to WTO rules and obligations to an extent not observed in previous rounds. Furthermore, new acceding countries became subject to considerably more stringent liberalisation accession requirements. Some of the consequences of that change are also illustrated in Table 1 – the WTO members that have not bound all their tariffs are typically developing countries that joined the system under the General Agreement on Tariffs and Trade (GATT), before the creation of the WTO in 1994; the average bound tariff is significantly lower for recent members of the WTO (e.g. China and Vietnam) than for old members (such as India and Thailand); and to a lesser extent, the same is true for the applied tariffs. The Uruguay Round-sponsored changes notwithstanding, with the onset of the Doha Round of trade negotiations the view that developing countries should be treated differently – and that the Uruguay Round requirements were too stringent and too costly to implement for poor countries – resurfaced. As a result, efforts to broaden market access for least-developed countries and to lower the costs of implementing the Uruguay Round’s new disciplines have been at the centre of the negotiations. Given that the Doha Round seems to have hit a wall, this is a good moment to assess the merits and accomplishments of SDT disciplines. The underlying justification for SDT is that temporary protection and preferential access to larger markets could foster infant industries and help diversify the industrial base of developing countries, ultimately leading to sustained, faster economic growth. But can this set of exceptions in the multilateral trading rules deliver on those promises? Now, if externalities, learning, and other dynamic effects are important, the role of SDT might be rationalised. However, on top of requiring information unavailable to policymakers, an aggravating problem is that many SDT policies, such as the non-reciprocal preferences under the GSP, are defined by developed economies. It is unrealistic to presume that they would design policies having as their primary goal the interests of developing countries. Empirically, evaluating the impact of SDT as a whole is challenging, as disentangling its effects from other contemporaneous policies is typically unfeasible. One option is to compare the behaviour of similar countries that joined the GATT/WTO system before and after the UR, exploring the changes in accession requirements after the UR. Interestingly, the few attempts to explore those differences point toward a clear benefit for developing countries in moving away from SDT disciplines (e.g. Tang and Wei 2009). Now, while useful, those results remain far from delivering a final verdict on the desirability of SDT or GSP. First, because to understand the nature of the operating forces and mechanisms, one needs to go down to more detailed, firm-level analysis. Surprisingly, to date there have been no such studies.5 Furthermore, even if nonreciprocal preferences stimulate exports of beneficiary countries, the answer to the deeper, more relevant question of whether they promote economic growth or simply yield rents to selected country-industry pairs remains elusive. This is not an easy question to answer empirically, but a central one for a conclusive appraisal of those programmes. Another concern is that the existing schemes of nonreciprocal preferences, whereby developed economies (implicitly) use preferences as bargaining chips to demand cooperation from developing countries in nontrade areas, can constitute a force toward keeping multilateral tariffs high. This follows from a line of research that indicates that non-reciprocal preferences are associated with ‘tariff substitutability’ – lower tariffs to a group of countries come at the expense of higher tariffs vis-à-vis all other countries. On the other hand, most of the literature also indicates that reciprocal exchange of preferential access tends to yield ‘tariff complementarity’ – lower tariffs to a group of countries leading to lower barriers also on imports from other countries. Thus, if preferential tariff concessions had to occur in the context of full-fledged free trade areas – as the EU has been required to do, under Economic Partnership Agreements, vis-à-vis the preferences it has historically offered to its former African, Caribbean and Pacific colonies – we may observe instead lower multilateral tariffs as a result of preferences to developing countries. Albornoz, F, I Brambilla and E Ornelas (2016) "The impact of the Generalized System of Preferences on firms’ exports", Mimeo. Bagwell, K and R Staiger (2014) "Can the Doha Round be a development round? Setting a place at the table", in R C Feenstra and A M Taylor (eds), Globalization in an Age of Crisis: Multilateral Economic Cooperation in the Twenty-First Century, Chicago: University of Chicago Press. Cadot, O and J de Melo (2008) “Why OECD countries should reform rules of origin”, World Bank Research Observer, 23(1): 77-105. Frazer, G and J Van Biesebroeck (2010) "Trade Growth under the African Growth and Opportunity Act" Review of Economics and Statistics 92(1): 128-144. Hoekman, B, C Michalopoulos and L A Winters (2004) "Special and differential treatment of developing countries in the WTO: Moving forward after Cancun", The World Economy, 27(4): 481-506. Ornelas, E (2016) “Special and differential treatment for developing countries”, CEPR Discussion Paper 11162, forthcoming in K Bagwell and R Staiger (eds), Handbook of Commercial Policy, chapter 15. Tang, M-K and S-J Wei (2009) "The value of making commitments externally: Evidence from WTO accessions", Journal of International Economics, 78: 216-229. See Bagwell and Staiger (2014) for the development of this line of reasoning. See Cadot and de Melo (2008) for an assessment of the rules of origin under GSP and proposals for reforming them. Frazer and Van Biesebroeck (2010) were the first to provide such an analysis. Albornoz et al. (2016) provide a firm-level analysis of the impact of the American GSP exploiting a partial suspension of Argentina in the 1990s, but their study is still ongoing. For proposals to make SDT more effective, see for example Hoekman et al. (2004).